Encourage bats to colonize your backyard using the BestNest Single-Celled Double Bat House Kit. Offering bats a lasting and safe roosting spot helps them maintain their population levels, and a dual house system often has greater occupancy rates than single units. This remarkable kit provides all you need to set up a bat sanctuary in your yard. The two BestNest Single-Celled Bat Houses can each accommodate 85 bats, and their deeply grooved landing platforms and interior surfaces offer plenty of clinging spots. The single chamber of each house measures 1.75" deep, and a 0.25" ventilation slot on the front of each piece aids in maintaining the internal temperature. A slanted roof on each unit directs rain away from the bats, and the furniture grade, all wood construction is made to last. Secure the top lip of each house to one of the long sides on the included, Hexagonal Bat House Pole Adapter, and the landing platform on each home to the lower bracket. The extended flange of this adapter inserts into the included Heath Martin House Pole, for a wonderful and secure display at just the right height for bats. Once you have perfectly mounted your bat houses, read through the included Stokes Beginner's Guide to Bats book for in-depth information on caring for your new colony. 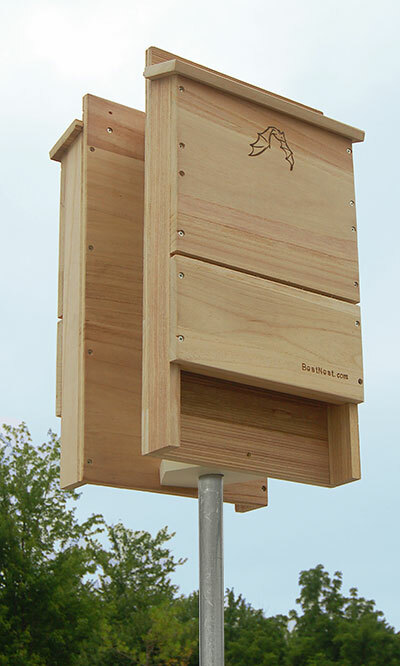 Offer beneficial bats several roosting options with this Single-Celled Double Bat House Kit.